In the era of precision medicine, the healthcare industry is focused on the development of advanced therapeutics to deliver improved patient care and enhance treatment outcome. The increasing prevalence of chronic disorders and an overall increased demand for preventive medication with minimal/no side-effect are promoting the growth of the human microbiome modulators market. Thereby, the advent of precision medicine approach and development of individualized care regimes are improving quality of life of the patients and reducing economic, societal, and clinical burden. Presently, product categories within the human microbiome modulators market include probiotics and creams, prebiotics and dietary supplements, and drugs. Till date, the healthcare industry has witnessed a number of successful products modulating the gut microbiome, addressing digestive health. However, successful research substantiating a more inclusive role of the microbiome in human health and diseases, including immune health, women’s health, oral health, and other health applications such as skin health, have further drawn the attention of several pharmaceutical companies to venture into this lucrative market by either advancing their respective product portfolios or acquiring companies with immense potentials. Further, several players are now focusing on the development of drugs modulating the microbiome, which is anticipated to enhance the growth of the entire market. The purpose of the study is to gain a holistic view of the global human microbiome modulators market in terms of various factors influencing the market, including regulatory reforms and technological advancements. The market has been segmented into ‘products’, ‘applications’, and ‘regions’. The scope of this report is centered upon conducting a detailed study of the products allied with the human microbiome modulators market. 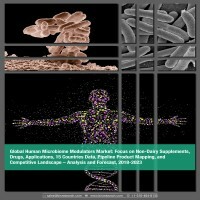 In addition, the study also includes the exhaustive information on the unmet needs, perception on the new products, competitive landscape (including pipeline analysis), market share of leading manufacturers, growth potential of each product, application, and region, as well as other vital information with respect to human microbiome modulators market. The report presents the reader with an opportunity to unlock comprehensive insights with respect to the market and helps in forming well-informed strategic decisions. The research uncovers some of the substantial parameters that must be taken into consideration before entering into the market. This research report aims at answering various aspects of the global human microbiome modulators market with the help of the key factors driving the market, the restraints, and the current growth opportunities that are going to shape the future trajectory of the market expansion. The report includes an in-depth examination of the key players and recent developments taking place in this market. Moreover, the report includes chapters on market dynamics (market drivers, opportunities, and challenges) and industry analysis as well. The research study highlights the factors governing the industry attractiveness with Porter’s Five Forces for a comprehensive understanding of the global human microbiome modulators market. Moreover, the study includes detailed product mapping, market estimation, and analysis of key trends in multiple geographical regions, growth of human microbiome modulators market in each region for different applications, and the key strategies and developments by the prominent human microbiome modulators manufacturers. • What are the major market drivers, challenges, and opportunities in the global human microbiome modulators market? • What are the underlying structures resulting in the emerging trends within the human microbiome modulators industry? • What was the market value of the leading segments and sub-segments of the global human microbiome modulators market in 2017? • How will each segment of the global human microbiome modulators market grow during the forecast period and what will be the revenue generated by each of the segments by the end of 2023? • How will the industry evolve during the forecast period, 2018- 2023? • What are the key developmental strategies which are being implemented by the key players in order to sustain in the competitive market? • What are the key product types in human microbiome modulators market? What are the major benefits of each product type? • How has the market been segmented on the basis of application? Which application is dominating the global human microbiome modulators market and its reason? • Who are the key manufacturers in human microbiome modulators market and what are their contributions? • What is the status of each major human microbiome modulators manufacturer with respect to their pipeline? • What is the scope of each human microbiome modulators product in North America, Europe, Asia-Pacific, Latin America, and Rest-of-the-World? • What are the key regulatory implications in developed and developing regions for human microbiome modulators? • What is the growth potential of human microbiome modulators in each region, including North America, Europe, Asia-Pacific, Latin America, and Rest-of-the-World? • Which human microbiome modulators product type is having most promising growth and in which application type? The key manufacturers who have been contributing significantly to the human microbiome modulators market include Sanofi S.A., The Procter and Gamble Company, Bayer AG, Koninklijke DSM N.V., E. I. du Pont de Nemours and Company, Yakult Honsha Co., Ltd., BioGaia AB, Probi AB, Chr. Hansen Holding A/S, Ingredion Incorporated, and Immuron Ltd., among others. 4.1 Legal Requirements and Framework in the U.S.
8.6 Garden of Life, LLC. 8.19 Yakult Honsha Co., Ltd.
Non-communicable diseases (NCDs) or chronic diseases are a combination of genetic, physiological, behavioral, and environmental factors. Generally tending to be persistent for long durations, NCDs impose immense economic burdens on countries. Given the fact that in 2015, the global healthcare expenditure was estimated by the World Health Organization (WHO) at approximately $7 trillion, the escalating prevalence of NCDs such as diabetes, obesity, cardiovascular diseases, respiratory diseases, and cancers, among others, have significantly driven this expenditure. Expected to reach over $8.5 trillion by 2020, the global health expenditure has been one of the leading causes of economic burden over governments, worldwide. As of WHO’s estimates in 2016, NCDs are responsible for almost 71% deaths globally, killing 41 million people each year. Also, WHO’s estimates in 2017 report of a global population of 7.55 billion individuals, a recurrent factor in having direct consequences upon increasing the global disease burden. In addition to the aforementioned estimates, the United Nations Department of Economic and Social Affairs/Population Division estimated that the life expectancy increased from 67.2 years to 70.8 years in the years 2010-2015. In the same report, it was also estimated that approximately 13% of the global population was aged 60 years or above. Compounding these factors, the global economic, clinical, and social burden of NCDs has been escalating at a rapid pace. Another largely undermined factor for the rising global disease burden is antimicrobial resistance (AMR). Largely a natural phenomenon, antimicrobial resistance is triggered by the excess usage of antibiotics for treatment of diseases with microbial origins. A complex issue of global concern, AMR is majorly driven by human action and perverse incentives. The misuse of antibiotics in the medical, agricultural, and veterinary sectors, which also include inappropriate antibiotic prescription, the overuse of antibiotics in the livestock sector, and insufficient hygiene practices in hospital, all contribute significantly to the rise of AMR. The advent of precision medicine, a patient-centric treatment approach, is perceived to be promising in driving a paradigm shift in the healthcare industry, facilitating the elimination of uncertainty pertaining to trial and error method of medications, and consequently eliminating unnecessary healthcare spending. As an extension of the precision medicine approach through the Human Genome Project (HGP), the Human Microbiome Project (HMP) was implemented to acquire the ‘complete’ scope of the human body for precision care. With results published form the Phase 1 of HMP (HMP1), the scientific scope for disease treatment was significantly expanded by the realization of the central role of the microbial population co-existing with the human body. NCDs, being an area direly in need of immediate therapeutic interventions, have naturally become a prevalent scope for microbiome modulation. Consequently, the evolution of human microbiome modulators has come a long way from addressing only digestive complications via dairy-based probiotics to ongoing clinical trials for microbiome-targeting drugs that address a range of diseases indications. Till 2010, the healthcare industry was largely dominated by synthetic drug modules catering to major disease indications. However, post-2010, precision care has been the prime target for any therapeutic module. With the microbiome’s unravelling as a central component of human health and disease, precision care has evolved significantly into becoming a more integrative and more personalized approach. As of 2018, the microbiome modulators market can be seen to have exposure in very few countries. However, with the rapid advancements taking place and an exponential progression in the number of companies entering the space, access to consumers is bound to become easier. The global human microbiome modulators market has been witnessing a steady annual growth rate of approximately 6.08% in past three years (2015-2017), and the market is expected to continue to grow with a double digit CAGR of 16.29% during the forecast period, 2018-2023. Growing at a CAGR of 13.92% during the forecast period of 2018-2023, the probiotics and creams product segment is anticipated to generate a value of $1.66 billion in 2023. However, the global market for drugs is anticipated to grow at the fastest CAGR of 22.26% during the forecast period 2018-2023. The purpose of the study is to gain a holistic view of the global human microbiome modulators market in terms of various factors such as recent trends and product advancements, influencing the market. The scope of this report is centered upon conducting a detailed study of the products allied with the human microbiome modulators market, which includes various products such as probiotics and creams, prebiotics and dietary supplements, and drugs. However, the market estimation only comprises manufacturers of human microbiome modulators. The human microbiome modulators market is segmented into three different parts namely products, applications, and region. The global market value was estimated using these three different approaches and was validated with one another. These segments are further segmented into several sub-segments to ease the market estimation and to gain a holistic view of the market. Based on the region, the global human microbiome modulators market is segmented into North America, Europe, Asia-Pacific, Latin America, and Rest-of-the-World (RoW). North America is the leading contributor to the global human microbiome modulators market and was responsible for a 38.47% share of the global market values in 2017. Also, North America is expected to grow the fastest among all other regions with a CAGR of 18.79% during the forecast period 2018-2023. The key human microbiome modulator manufacturers who have been contributing significantly to the human microbiome modulator market include Sanofi S.A., The Procter and Gamble Company, Bayer AG, Koninklijke DSM N.V., E. I. du Pont de Nemours and Company, Yakult Honsha Co., Ltd., BioGaia AB, Probi AB, Chr. Hansen Holding A/S, and Ingredion Incorporated, among others.